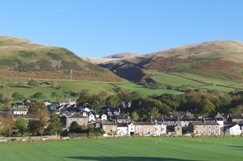 Several bookshops, an outdoor kit shop, the Sedbergh School outfitter; a picture framer, a flower shop, a craft workshop, two weavers' workshops and a hardware store. There is also a Spar supermarket five minutes away from the cottage on Station Road. There is a dental practice on Main Street, and a medical centre next to the Spar on Station Road. There is also a veterinary practice on Back Lane. 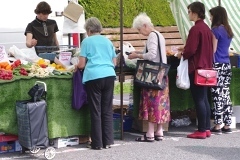 For more information about shops and facilities in the Sedbergh area, go to the Community Information Centre at 72 Main Street, or visit the Sedbergh.Org.Uk websites. Sedbergh is a walkers paradise. From Woodside Avenue there is a footpath that takes you to Howgill Lane. 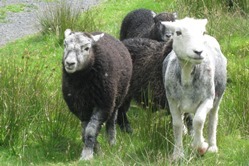 From there you can follow a popular route through Lockbank Farm to the top of Winder and beyond. 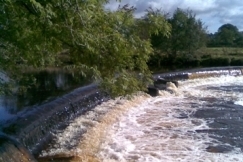 There are also many riverside paths along the banks of the Rawthey and the Dee. There is little waymarking, but maps are available at the Community Information Centre on Main Street and at some bookshops. For fishing see the Sedbergh Anglers website. Tickets for many reaches of the Rivers Dee, Rawthey, Clough and Lune are available from Premier Express, 73 Main Street, Sedbergh. A popular attraction is Farfield Mill arts and heritage centre on the Garsdale road, a mile out of Sedbergh. 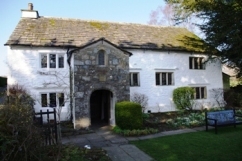 For anyone interested in history, the Quaker Meeting House a mile down the Kirkby Lonsdale road is well worth a visit. It also makes for a very nice walk (Direct access has been blocked from the river, so you need to go along the South bank of the Rawthey, then right onto the old railway embankment, then left onto a public path across the fields for the last few hundred yards). 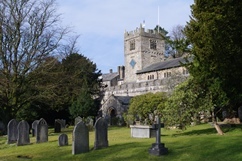 For more information about what is going on in the Sedbergh area, go to the Community Information Centre at 72 Main Street, or visit the Sedbergh.Org.Uk website. Hawes, 15 miles – Wensleydale Creamery and Tuesday market. 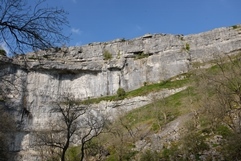 Horton–in–Ribblesdale, 27 miles – The Pen–y–Ghent–Café is the usual start for the Three Peaks walk. 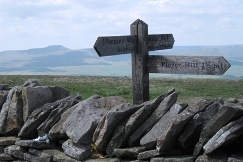 (pictured right: Ingleborough from the top of Pen–y–Ghent). Ingleton, 17 miles, and the White Scar Cave. Sizergh Castle and Levens Hall, both between Kendal and Milnthorpe. Coniston, 43 miles (Take the A590 to Greenodd and then head North to avoid Kendal and Ambleside). 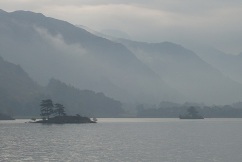 There are launches and a steamer to take you around Coniston Water, and a chance to visit Brantwood, home of John Ruskin, or climb the Old Man of Coniston. 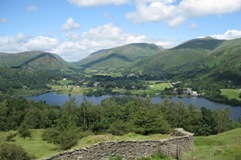 Keswick, 47 miles via Penrith, and Derwent Water (pictured). 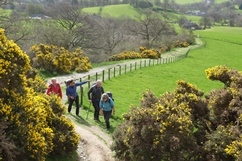 Eskdale, 57 miles (via the A590 to avoid the Hardknot Pass), for Muncaster Castle and the Ravenglass and Eskdale Railway, not to mention some fine walking, both strenuous and gentle. "The property was in a good location for touring the Dales and Lakes, shops only a short walk, supermarket just down the road!" — Mr. W.